Lake Living just got real here on Lake Greenwood! 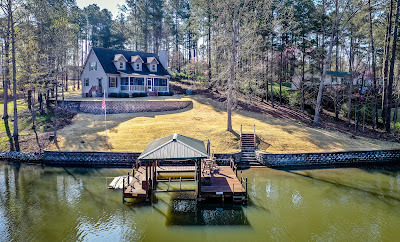 Have you always wanted to be on the lake but couldn't afford it well look no further. This Cape Cod Style home is situated on 1.8 acres and has it all with 2202 HSF of living, 3 bedrooms 3 bathrooms a 19x16 bonus room, with a detached garage. Having a large dock in place with decking providing plenty of seating area, a boat slip, boat lift, and jet ski dock you are ready to start the fun! Now, let's get to the features of the home, which is well kept, low maintenance and no detail overlooked. Throughout the home, you will find crown molding, 5" baseboards, thick window casements, most rooms having ceiling fans, the bathrooms have upgraded shower/tubs to include grab bars. In the Kitchen, there are specialty made cream cabinets with coffee highlights and adorned with rope and crown molding with lots of cabinets, counter space, drawers, 2 lazy Susans, pantry, Frigidaire Gallery Black Appliances, Insinkerator garbage disposal, and a great view of Lake Greenwood. The Family Rm with eye-catching views of the lake with gleaming hardwoods that flow into the hallways, a gorgeous stack stone fireplace with raised hearth and cedar mantle burns wood and provides excellent heat and atmosphere. The Master suite has a water view, nice walk-in closet which stretches along the 13' wall niche, shelving and hanging areas, plenty of windows allowing in natural light. Once in the Master bath that features a comfort height double sink vanity, shower/tub with grab bar, and two storage closets adding plenty of storage. On the other end of the hallway is the Guest bath with comfort height spacious vanity with double sinks, two storage closets, tub/shower with grab bar access to the hall but separate access to guest bdrm. The guest bdrm. just like the rest of the home has lots of natural light and a nice walk-in closet that easily fits clothes, ski vests, decorations, its all up to what you might need to store. The interactive map below shows 39 Pleasant View Court but not necessarily the exact location of the home itself. Directions: Hwy. 72 RT on Hwy 39 in Cross Hill proceed through town on Hwy 39 then RT at the stop sign, follow Hwy 39 then RT on Pineland Rd, bear RT at signs, Turn LT onto South Point Harbor Dr, RT on Pleasant View Ct home on RT down gravel drive past garage at the road.